Hi, everyone! I am officially back from vacation! I was so pleased to see that my scheduled posts made it up alright and that people seemed to enjoy them. I received a surprise when I got back from the beach and checked my email. 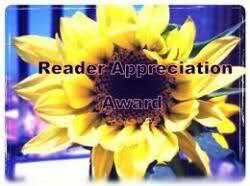 I had received the Reader Appreciation Award from the beautiful Yawatta Hosby! Thanks so much, Yawatta! I am ultra flattered by your sweet nomination! Wow…hard question. I am a color freak. Hmm…I could probably nail it down to leafy green. Getting. Unfortunately, I LOVE to give presents, but I am not terribly good at it. I have this strange inability to give people gifts that they actually want unless I nearly burst blood vessels in my brain trying. Last Christmas, I FINALLY gave my husband the presents he wanted and he loved them (and we’ve been together for nearly a decade)! So, I’d say getting, not because I’m selfish, but because I’m mildly handicapped at giving good gifts, LOL. I hope you all enjoyed the Reader Appreciation Award questions! For those of you that were nominated, I know you guys//gals are very busy and there is absolutely NO pressure if you can’t get around to answering the questions. However, I wanted to show my appreciation for all of you out there who inspire me to be the best writer and dreamer that I can be!